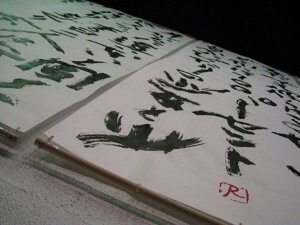 This is an one of the biggest Japanese Calligraphy work in Sydney. It describes following excerpt from a novel “On Seeing the 100% Perfect Girl One Beautiful April Morning” by Haruki Murakami. Long, long ago in a certain place there was a boy and a girl. The boy was 18 years old, and the girl was 16 years old. He was not a very handsome boy, and she was not a very beautiful girl. They were just an ordinary, lonely boy and girl who you might see anywhere. But they believed strongly that somewhere in the world there must be a girl and a boy who would match them 100 percent. One day they came across each other for the first time on a street corner.